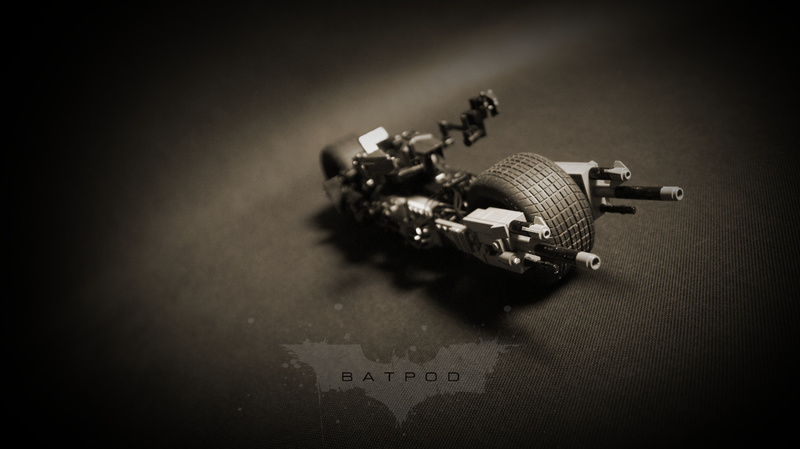 Model of the Batpod from Christopher Nolan’s Dark Knight movie. 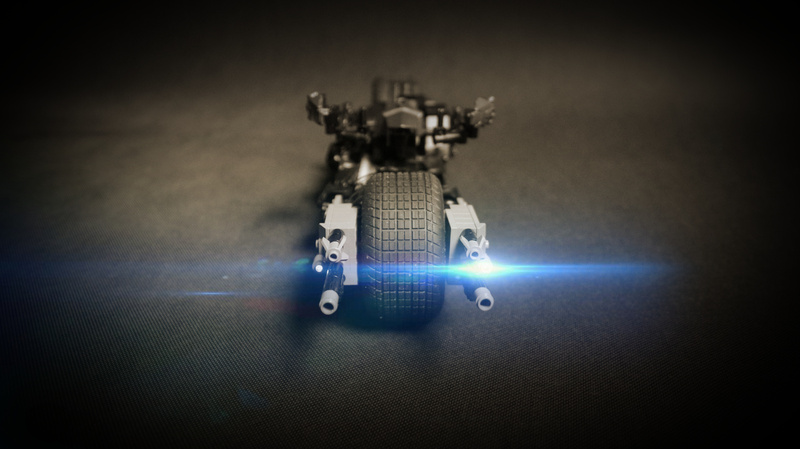 Features remote-controlled drive, steering and Lifelites LED kit. 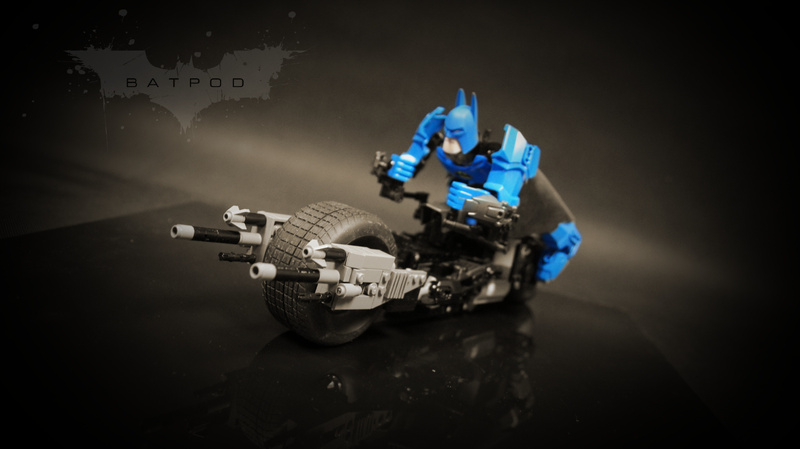 The original Batpod is my least favorite Batman’s vehicle in the whole Christopher Nolan’s trilogy. 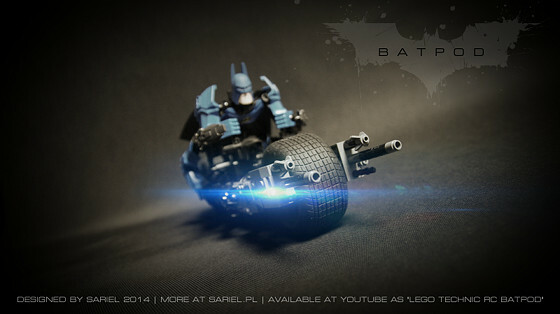 It feels unrealistic and far-fetched to say least, and comes as a sort of a disappointment after the awesome Tumbler. 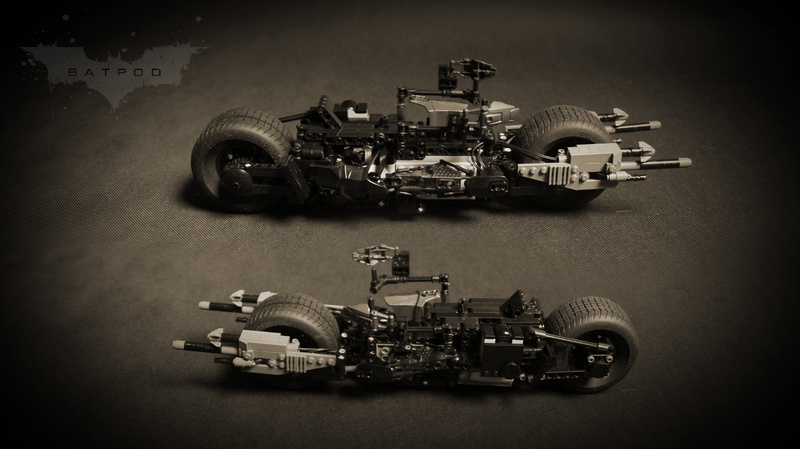 Yet the moment I first saw the 76023 Tumbler set with the realistic front tires, I decided to build a Batpod model. 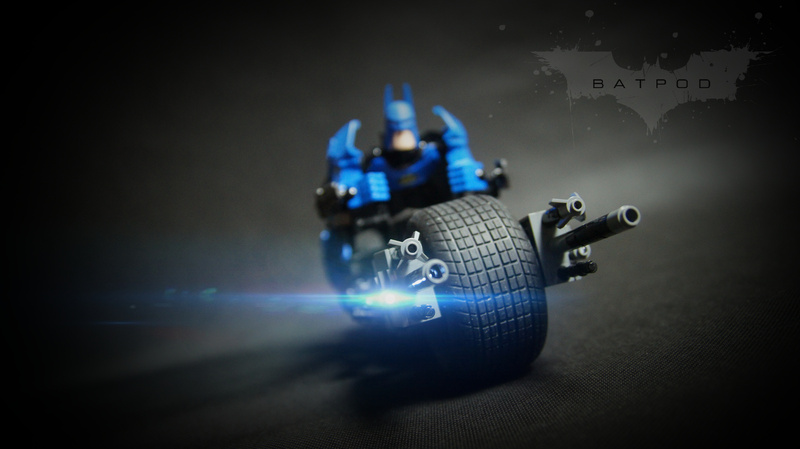 With these tires now available, there will be no doubt a number of excellent, great-looking Batpod models in the coming months – so I just wanted to make one that works. 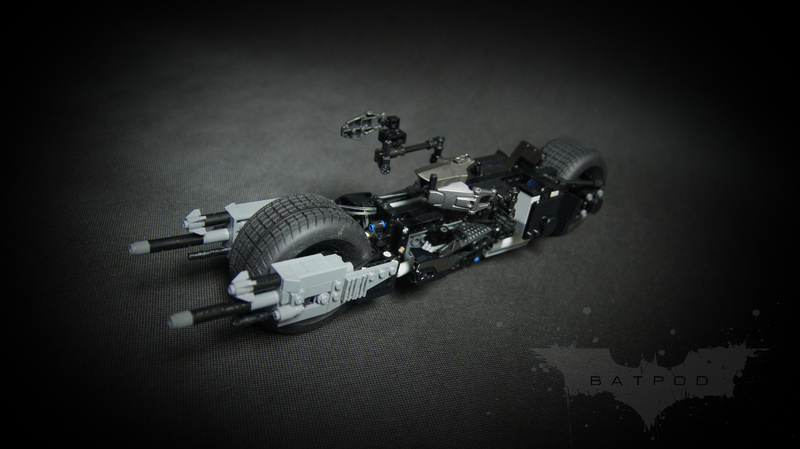 On the mechanical side, the model was plain and simple, with two motors sitting in the back and the 8878 battery in the front. 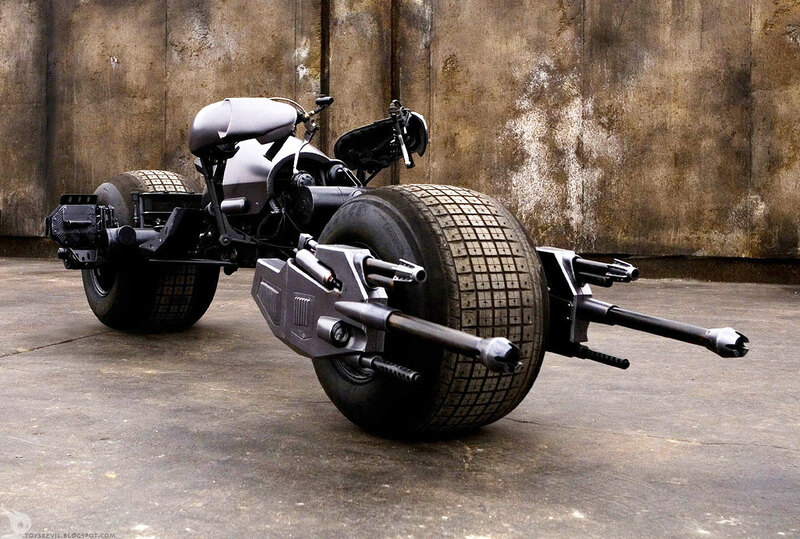 A PF L motor was driving a double wedge belt wheel with tire, which was pressed to the Batpod’s rear tire, thus bypassing its axle and driving the rear wheel directly. 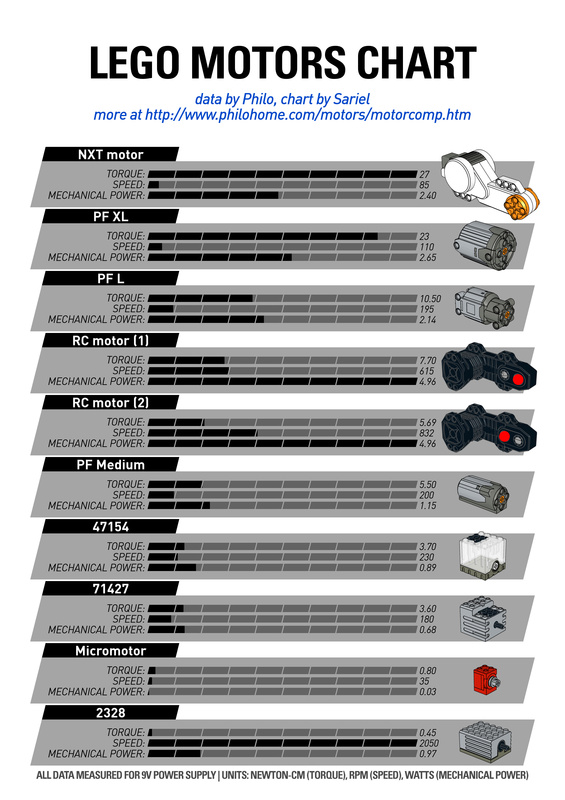 A PF M motor was driving a single small linear actuator, which was making the front wheel turn left and right. 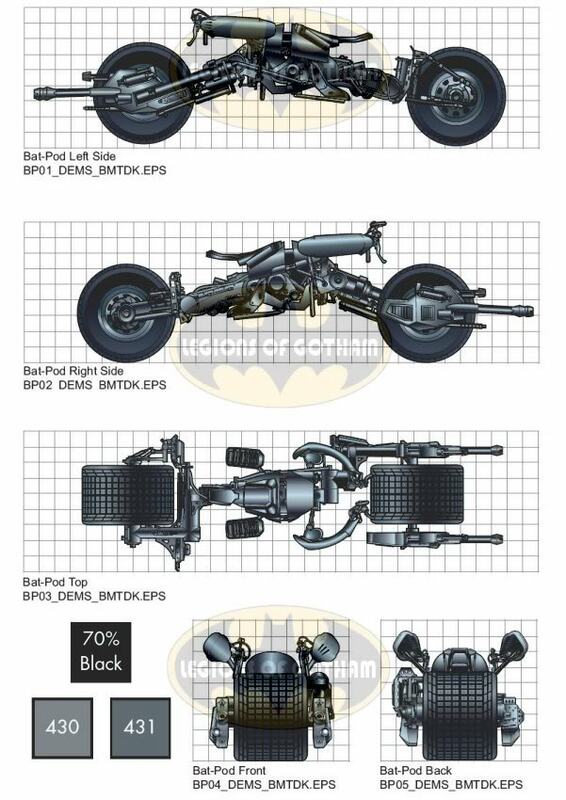 The original Batpod is supposedly articulated near the middle, but there is no convincing demonstration of it in the movie, and it would be extremely difficult to make all the mechanics fit in a two-piece chassis. 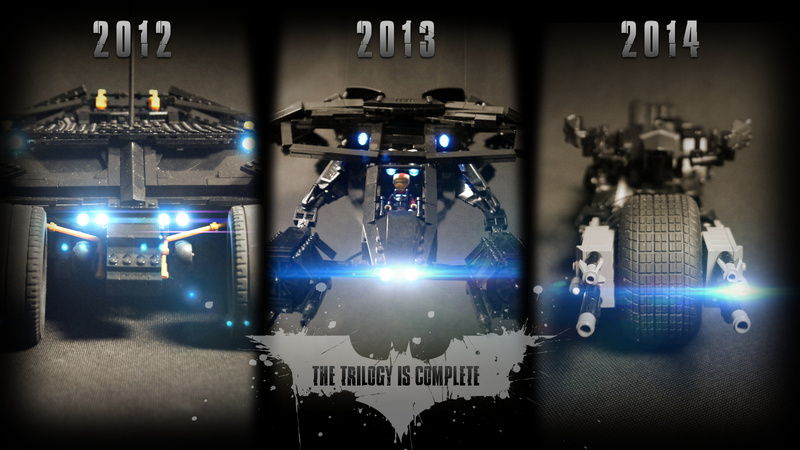 Additionally, a Lifelites LED kit was installed in four of the front cannons. 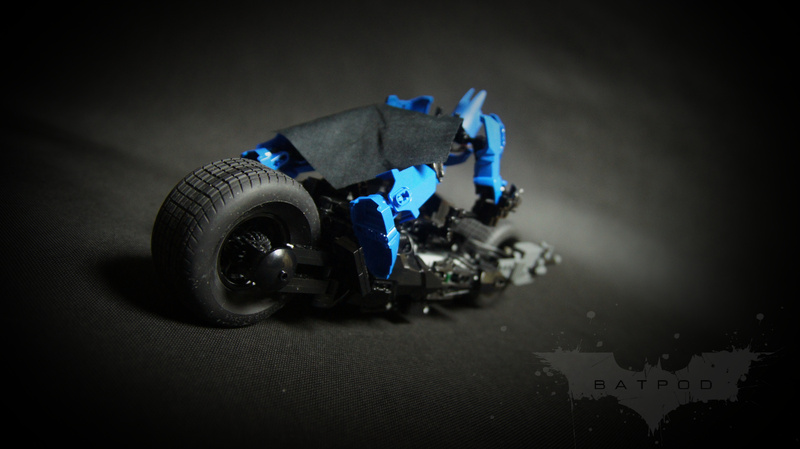 On the aesthetic side, it was clear from the start that the scale would require some compromises – the battery alone takes almost half of the chassis. 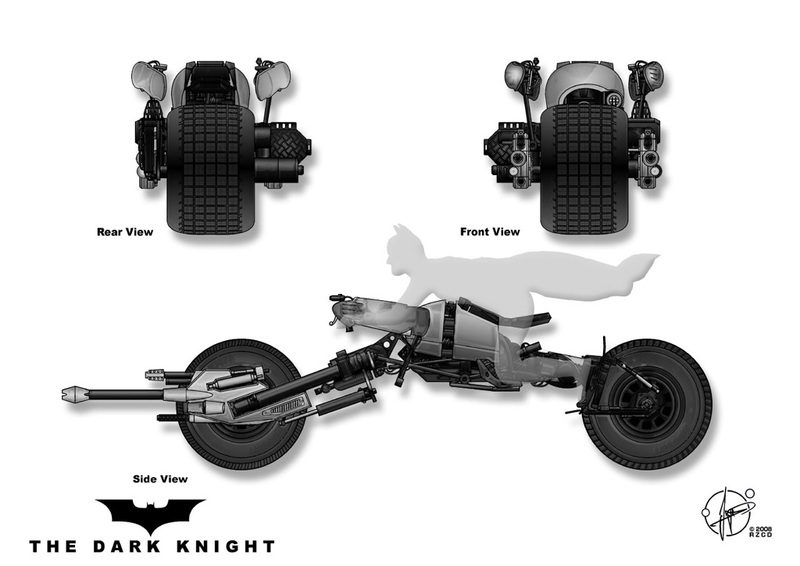 I have therefore attempted to accurately model the front and rear wheel area, and fit the mechanics in the middle. 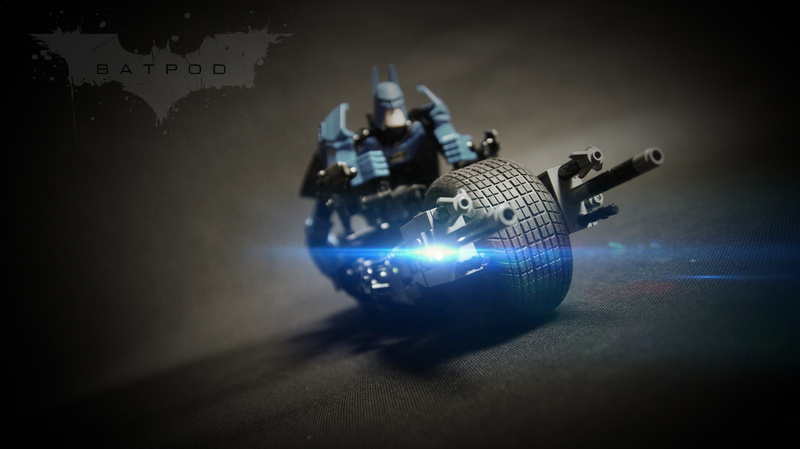 The Batpod’s middle part looks very chaotically in the movie, so I compacted all the necessary working components as tightly as I could and covered them with Hero Factory and Bionicle elements to keep the chaotic appearance. 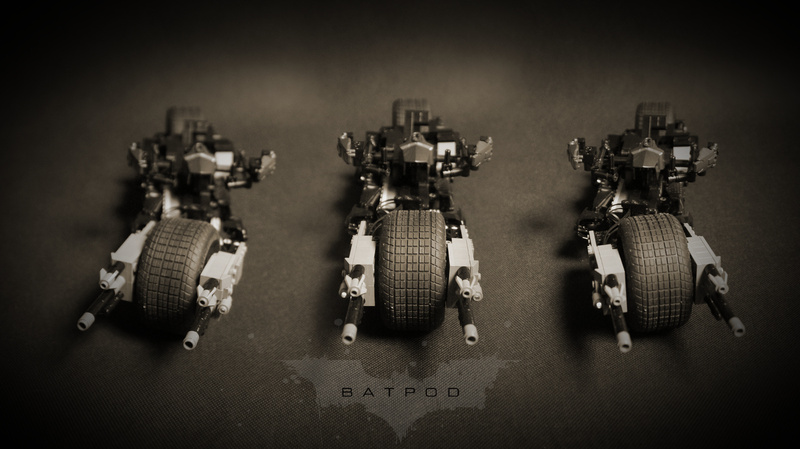 The silhouette of the Batpod was thus different than in original, but its front, rear and top looked reasonably accurate. 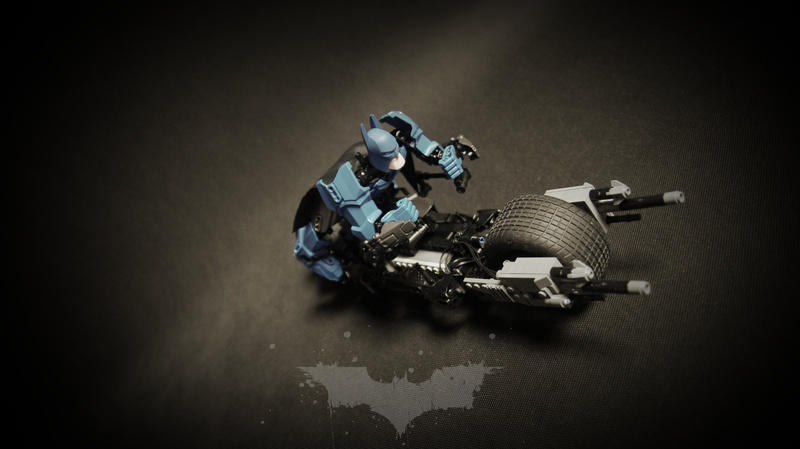 While waiting for the 76023 set, I have calculated that the model would look empty without and driver, and that it should be just the right size for a large Batman figure from the 4526 Batman set to ride. This proved true, although I decided to remove the weird spiked “cape” of the original figure and to replace it with a custom one, which I cut out from a plain black flag. 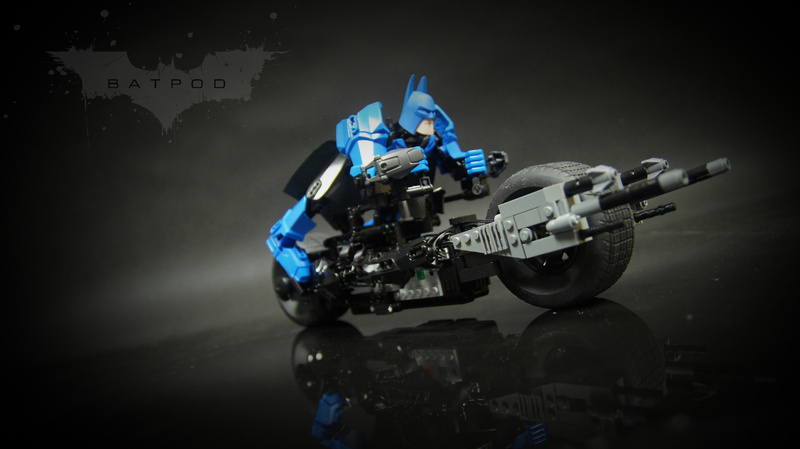 Hi,first of all im a huge fan of your work.Im also trying to put together my own batpodIi have a samll question ,the handles which you used are from the Bionicle series but can you pls tell from which set exactly coz thats the only part im left with ! None, as usual. 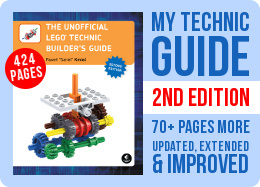 The photos and description should be sufficient for anyone who isn’t too lazy. 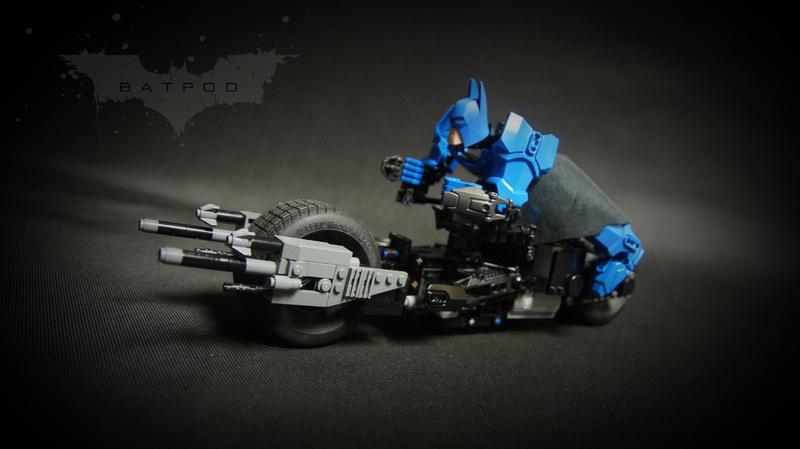 I like the pod but your custom cape is horrible. 😛 Nice video. Thanks. 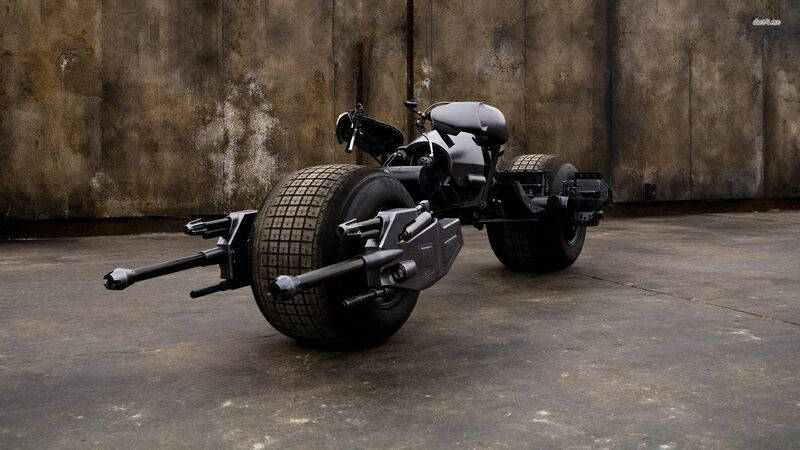 I have several batteries and none of them had a problem like this. 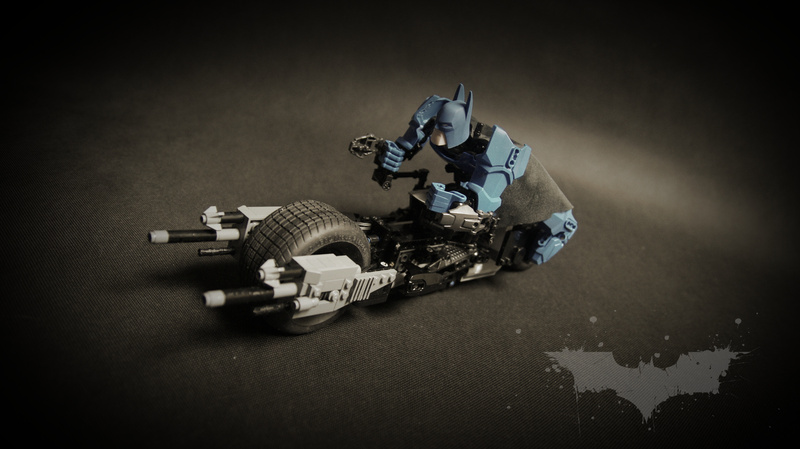 Your best option is to contact the Lego Customer Service and have the battery replaced. One of my batteries is kind of not working. I can charge the battery, and I can power the battery when the charging cable is attached, but when I remove the cable, the battery is not able to power it self. The green light is not glowing and attached motors are not getting power. Do you recognize the problem? I think under 1.5 meter. Hi, How big was the turning radius? I love the way you made every element blend in!!!! WELL DONE!!!! I would say they’re even harder. They’re a bit concave in the center, though. 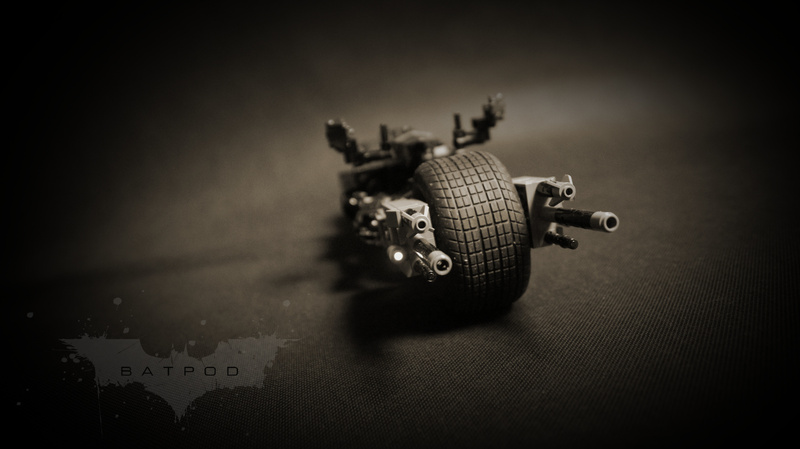 Are the new tires soft, or are similar to the rock crawler tire stiffness? It doesn’t, and it was rather slow anyway. Are you able to measure its speed or doesn’t it exist anymore?